The largest lake on the island of Bali lies on the volcanic caldera between Mount Batur and Mount Abang, over 1000 meters above sea level. The clean water, blue skies, and sweeping green landscape have led to some comparing it to the European Alpine regions. While there are a lot of activities around the lake, an easy way to spend the time here is to just steak scroll around the shorelines. During rainy season the lake is covered in mist for long hours. Look at the wide expanse of the lake and remember that it’s actually a massive crater, formed by a tremendous eruption in the past. The accommodations around the lakesides usually serve as a base for visitors who want to spend a few days exploring the Kitanami highlands area. Also, visit the popular attractions in the city by following Bali itinerary 3 days. Make sure to have thoroughly negotiated and finalised the rates of renting boats or taking boat tours before you head out into the water. Don’t touch the goods sold by the vendors, for they will then force you to buy it. Take a bus or bemo to here from Ubud or Denpasar. This is a very slow journy. How popular is Danau Batur? People normally club together Jemeluk Beach and Jimbaran Bay while planning their visit to Danau Batur. 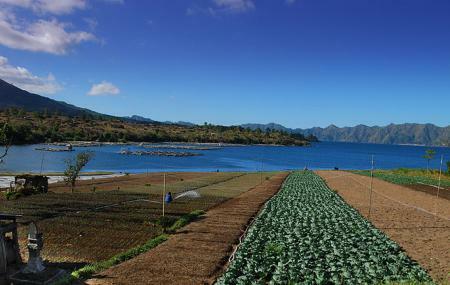 Located just besides mount Batur, this lake is a wonderful site for ones eyes. We just saw the lake from the top and the scenery was beautiful with clear blue water surrounded by green hills and clouds on the top. What a view!! This is a beautiful lake in Bali. We can visit mount Batur (view) and this lake together.The air is fresh and cool. The back ground view of hills is mesmerising. Very good place to spend some time with nature. The place is accessible by vehicle. There are few restaurants nearby. Worth spending an hour or so during visit to Bali. there are a lot spot around batur lake. better come here in summer because it used to rain here when rainy season. there is also a place for camping near the lake. Sad and abandoned environment, little offer of leisure and restoration. The shore of the lake full of garbage and plastics. The landscape does not compensate the long road.